Raoul Wallenberg was the diplomat who would appear like a phantom in Budapest, handing out the Swedish passports that saved some 15,000 Hungarian Jews from being murdered by the Nazis. But Wallenberg had no such help himself on January 17, 1945, when he was taken into custody by the Soviet forces that had liberated Budapest. The Swedish diplomat was never heard from again, and Moscow would later report that Wallenberg had died in Lubyanka Prison in 1947. But in the 63 years since his arrest, the Wallenberg family and generations of researchers have relentlessly pursued the possibility that the Swedish diplomat survived long after 1947, as a secret prisoner in the Soviet gulag system. "There are plenty of indications that he may have survived past 1947, and these deserve thorough examination," says Susanne Berger, a German-born researcher who has spent 15 years exploring Wallenberg's fate. Skeptics ask what motive the Soviets might have had for imprisoning Wallenberg, and for lying about his fate for decades after. Scholars exploring Wallenberg's relationship with the intelligence agencies battling each other in wartime and postwar Hungary, however, suggest that Moscow may have perceived the Swede as a spy for the West. "There were few if any neutral businessmen traveling about Europe [in 1944] who did not have some contact or other with some intelligence service, and probably with several," says historian C.G. McKay. And, he says, Wallenberg was no exception. The Swedish diplomat had been recruited to lead the mission to rescue Budapest's Jews by War Refugee Board member Olsen Ivers, who was also head of the Stockholm station of the U.S. Office of Strategic Services (OSS), the wartime precursor to the CIA. Swedish Security Police, according to McKay, have wiretap records of a cryptic 1943 phone conversation between Wallenberg and British national Cyril Chesire, who headed both the British Passport Office and the British Secret Intelligence Service (SIS) in Stockholm. 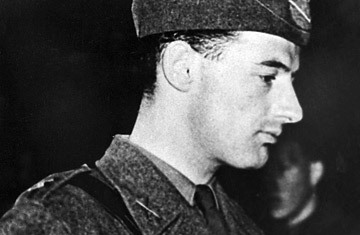 While in Budapest, Wallenberg also had well-documented contact with individuals linked to British intelligence, although American Wallenberg researcher Susan Mesinai suggests he was not necessarily aware of their espionage work. And others have suggested he may have had links with another U.S. wartime intel operation known as the Pond, and that there are still unanswered questions about Wallenberg's relationship with Swedish intelligence. "Raoul Wallenberg was attempting to use the OSS and almost anyone else to help him help people escape," argues Chris Simpson, a Professor at American University in Washington. "Meanwhile the OSS was attempting to use Wallenberg as a source of intelligence."